Add the warm water and honey (or sugar) to a large bowl or the bowl of a stand mixer fitted with a kneading hook. Sprinkle the yeast over the water, stir and let stand 5 minutes. To the bowl, add the butter (or oil), the salt, 3 cups of the flour and the dry milk. Mix until well combined. Begin adding more flour first by the 1/2 cup full, then reducing the amount until your dough comes together in to a smooth dough. (You’ll use 5 1/2-6 cups total, probably). As your dough begins to reach the right consistency, add the millet and sesame seeds and continue mixing until they are well incorporated in the dough. Place dough in a well-greased bowl, cover with plastic wrap and allow to rise until doubled, about 1 1/2 hours. Prepare two 8 1/2 x 4-inch loaf pans by greasing well. Set aside. Once dough has doubled, remove to a lightly floured surface, deflate lightly and divide the dough in to two equal pieces. Roll or press dough in to a rectangle approximately 8 inches wide by 14 inches long. Starting with the short end, roll the dough jelly roll style and pinch together the seam. Place in to prepared loaf pans with the seam down. 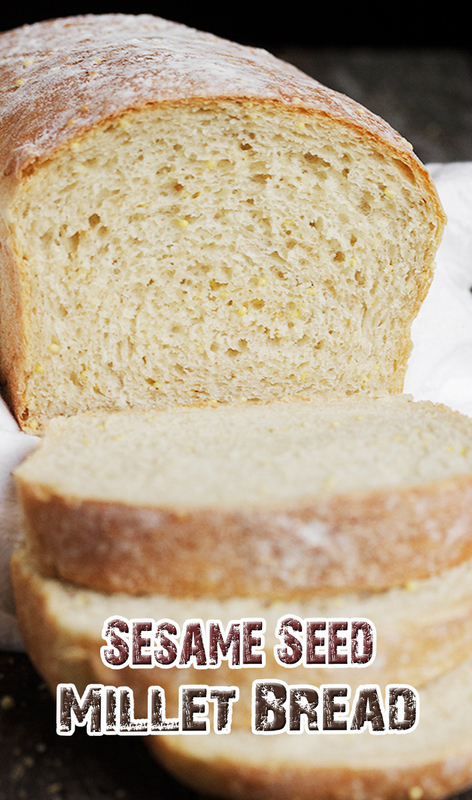 Be sure that the seam is centred on the bottom of the pan, to avoid a lopsided loaf. Repeat with the other piece of dough. Cover loaf pans with plastic wrap that has been sprayed on the underside with cooking spray. Allow to rise until loaves rise above the edge of the pan in the centre by about an inch. Preheat oven to 350° F. with rack in centre of oven. When loaves have risen, bake in the pre-heated oven for 30-35 minutes or until browned and hollow-sounding when tapped. Remove from oven the immediately remove loaves from pans and place on a cooling rack to cool completely.